The Crested Butte Titans track team spent 20 hours traveling to and from Eagle, Colo. as well as competing at the Eagle Valley Invitational in the I-70 corridor on Saturday, April 5. While parents, athletes and coaches all look forward to track season as an opportunity to leave the snowy climes of Crested Butte and head for greener pastures of the Western Slope, Eagle was anything but green, with spitting snow, wind and temperatures hovering in the mid to high 30s. 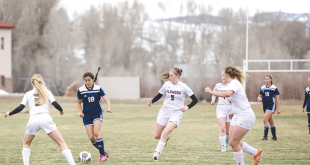 In addition to the weather, the Titans found themselves battling 21 other teams from the Western Slope. Senior Emma Coburn joined the team for the Eagle Valley event to lead the girls team in points, finishing second in the 800-meter run with a time of 2:27.90 and seventh place in the 200-meter dash. In addition, Coburn set a new Crested Butte Community School record in the 400-meter event with a time of 1:03.11 and taking third place at the meet. Junior Emma Vosburg added to Coburn’s point-scoring efforts with a seventh-place finish in the 400-meter and a fourth place in the 3200-meter run, posting a time of 13:15. Freshman Erin Kelly joined Vosburg to score points in the 3200-meter with a fourth-place finish and a time of 13:31.54. Despite the weather, junior Kelli Hargrove improved on her time in her second attempt at the 800-meter run of her high school career, shaving over 15 seconds off her initial time one week ago. Freshman Karleigh Dean handled her introduction to high school track with some solid results in the 100-meter and 200-meter dash, as well as joining in on the 4×200-meter relay. Junior Jack Linehan led the boy’s team in Eagle Valley, taking fifth place finish in the 800-meter run with a time of 2:08.49. In addition, Linehan managed to rally a 4×800 relay team prior to the meet. Linehan called on sophomore Ricky Sandoval, freshman Jeffery Hargrove and sophomore Nicholas Harper-Johnston to join forces for the relay race, and the team rallied to take ninth place in a field of seasoned relay squads. “It was great that Jack got them all to do that,” says Fuld. Sandoval continued to improve in the long jump, setting a personal record of 16 feet, eight and a half inches; Harper-Johnston ran the 1,600-meter event in 5:26.98. 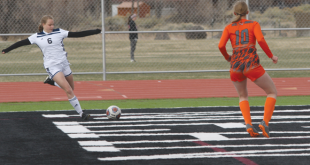 With spring break coming next week, the team will continue training but take a break from competitions until Wednesday, April 23, when the freshmen and sophomores head down-valley for the annual Gunnison freshmen/sophomore meet. The entire team returns to competition on Friday, April 25, when they head to the Montrose Invitational, the first state qualifier event of the season for the Titans.